How about $320,000 - is that real savings? That is what was just reported that IBM saved in a blog post over at the Virtual World News, titled IBM saves $320,000 with Second Life Meeting. The savings is net after an $80,000 investment that IBM made in holding a major international conference in the virtual world. Here is how to save money on business travel and meetings. What if you could be at two places at the same time without ever getting on a plane? 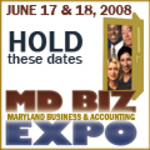 Last year at our MDBIZEXPO, we featured John Zdanowski, CFO of Linden Lab "live" from his San Francisco offices to our EXPO floor in Baltimore via the virtual world of Second Life. Without getting on a plane he spoke to an international audience at our conference center on CPA Island (in Second Life) and our live audience in Baltimore and had both groups interacting with each other. Who said you can't be two places at once? In a recent podcast with John, he said this about saving money using Second Life for real meetings, "Second Life is more compelling than a conference call, less intimidating than a video conference, and a hell of a lot better than business travel." 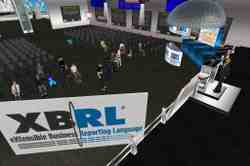 We have been "bullish" on these type of uses for Second Life for the past two years. 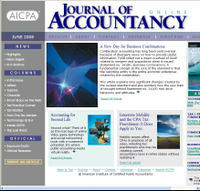 See our post about our last year's activities, titled 2008 Year in Review - CPAs start adopting Second Life for training. That is why we will be offering 24 hours of free CPE to our members for the upcoming year -with at least 14 hours via the virtual world of Second Life (including webcasts out of SL). It is our way of helping them out during this downturn. We have also held plenty of meetings like this already - XBRL, Increasing Business Transparency, Leading Knowledge Workers, Fair Value Reporting, Going Private to name just a few. We will be hosting a series of meetings over the next year where we can bring in experts "virtually" through Second LIfe to expose our members to thought leaders, innovative ideas, and breaking topics without spending their money or our money. I think that is pretty cool! What do you think? Are you ready to give it a try? I am very glad to see Second Life getting a fair shake in looking at the training potential of this fun and exciting medium. Check out the video of the session at this link. What do you think - are you ready to try Second Life? 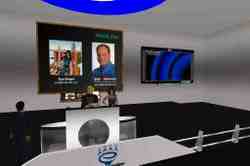 Still wondering what business potential virtual worlds like Second Life hold? You're not alone. It seems like everyone is trying to crack that nut these days. But you should have been on CPA Island earlier today. That's the Second Life home of the MACPA and the CPA profession, and it was the site of a unique presentation by one of Second Life's founding fathers. John Zdanowski, CFO of Linden Lab (the company that created Second Life), led a real-world presentation titled "The Virtual World of Second Life" as part of the 15th annual CFO Rising Conference in Orlando. At the same time, his Second Life alter ego, Zee Linden, gave the same presentation to a virtual audience in CPA Island's BLI Conference Center. 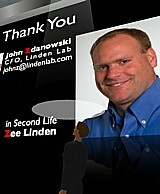 Zdanowski offered some interesting insights on Second Life as a business tool. And make no mistake: It's difficult to ignore Second Life's business potential. According to Zdanowski, Second Life residents spent more than 28 million cumulative hours in the virtual world in February alone, and they own more than 1 billion square meters of virtual space. More important, they have created almost 200 terabytes of digital goods, with more than 50,000 "in-world" businesses claiming virtual profits. 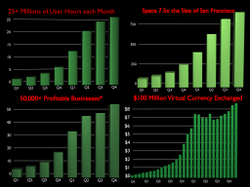 In short, virtual business is soaring. "Virtual worlds can be a great tool for businesses and will have a profound impact on our lives going foward," Zdanowski told the real-world and in-world crowds. "In the future, as the technology continues to improve, I expect to see virtual worlds become immersive experiences that are difficult to differentiate from the real world." Skepticism abounds, though. The most recent example is a Gartner report that warns companies away from virtual worlds until the technology improves. A couple of thoughts about that. The first is mine: The technology is going to improve, but why would you want to ignore virtual worlds until then? Isn't it better to familiarize yourself with virtual worlds and come up with at least a rudimentary business strategy now, so that you're ready to roll once the technology catches up? The second thought is Zdanowski's: "New technologies are often overhyped in the short term and underhyped in the long term," he said. "It's like trying to sell the first video phone, and it's exactly like e-mail. How many people had e-mail accounts in 1992? 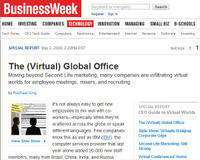 Virtual worlds like Second Life will be adopted over time." Beyond that, Zdanowski's presentation was a terrific example of the networking and educational potential Second Life holds. I "attended" his Orlando presentation from my home in St. Louis, and I met some people I might otherwise never have met. Zdanowski put it best: "Second Life is more compelling than a conference call, less intimidating than a video conference, and a hell of a lot better than business travel." Check out these other CPA-related Second Life resources, then tell us your thoughts about Second Life as a business tool.